Farmer Dave’s is a bustling farm in Dracut, Massachusetts providing fresh fruits and vegetables to markets and stores throughout the state. 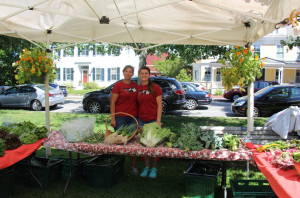 Farmer Dave busies himself with the developing farm and other properties around Massachusetts, but if you come to the Westford Farmer’s Market you may meet some of his great farm stand staff, like five-year veteran Haley. Haley began working at Farmer Dave’s when she was sixteen and living down the road from the farm in Dracut. Despite not having much of a background in agriculture Haley says she is hooked! Not bad for her first job. In the five years since, Haley says it’s been great to see how the farm continues to grow and even claims happily that it is becoming a lifestyle for her. Her favorite parts of the Westford Farmer’s Market are seeing little kids learn about new things and get excited about fruits and vegetables in ways she never did; she thinks the community is nice and tightly knit; and the best of all: dogs! One of the reasons we appreciate Farmer Dave’s at the Farmer’s Market is their commitment to ecological agriculture. They grow about 95% of vegetables without the use of synthetic sprays and use integrated pest management (IPM) principles to comprehensively reduce the need for pesticides. Farmer Dave is always looking to improve his farm with sustainable and organic methods.